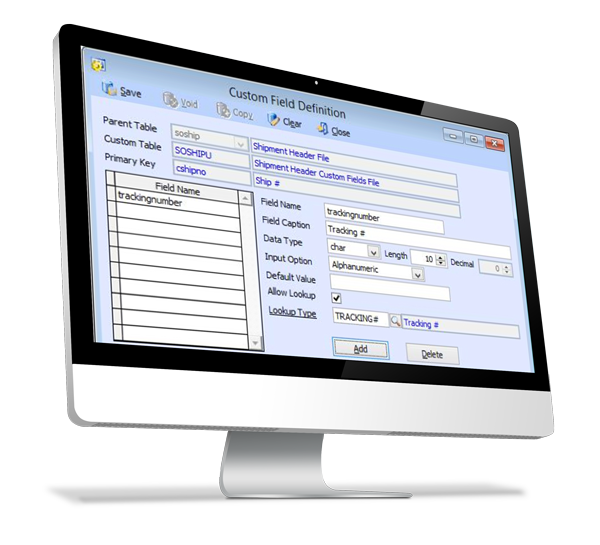 The AccountMate Custom Field Manager module is an engine that lets you add any number of data fields to existing AccountMate screens to meet your specific requirements. Custom fields can be added to master records or transaction header tables. These custom fields can be character, date, integer, logical or numeric in nature. Custom fields of any type can be assigned a default value while character-type custom fields can have a lookup which can be used to validate data and locate records. The ability to add custom fields to both standard AccountMate tables and non-AccountMate tables makes it possible to create the customizations your company needs without purchasing a source code license and modifying the source code. Custom fields are also seamlessly upgraded in future product releases.